When the New 52 started, DC chose to add some diversity to the founding of the Justice League. Did they do this by making John Stewart Earth's Green Lantern from the outset? No, they did it by calling Cyborg up from the JV squad. That would be like if the first X-Men movie had replaced Storm with Sunspot. At the brink of a catastrophic assault, this unparalleled league of heroes must come together to save the planet. Okay, apparently the Justice League packaging is just going to have generic text, rather than anything specific about the character. I know Batman v. Superman already stopped its plot for a five-minute recap montage of Cyborg's origin (he got blown up, so his scientist dad, Miles Dyson, lucked into sciencing him a new body with a Mother Box he had lying around for science purposes), but he's still the least-known member of the team. Tell us his real name is Victor Stone, tell us some things his robotic body can do, tell us anything except boilerplate chatter about the League. Save that for Superman or Batman's packaging, since even blind cave fish who have never experienced the surface world know who they are. 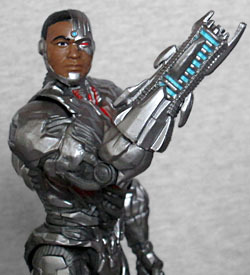 Cyborg is one of only two characters to be getting their first action figure in this line (the other being Flash), so this is our look at how Mattel handles a Ray Fisher likeness. Of course, since no one recognizes Ray Fisher yet, who's to say whether it's good or bad? Does Ray Fisher look like a less yellow-boned Trevor Noah? Mattel says yes! The original Cyborg was deeply rooted in '70s fashion (yes, he was introduced in 1980, but these things take time to filter in). He's been updated many times over the years, but the basic design remains light silver armor with a bit of skin still showing. The movie tones the skin way down, to the point where there's absolutely none below the neck - a choice which not only breaks with tradition, but also undermines the idea that he's a melding of man and machine. He just looks like he's wearing a suit of armor, a la Tony Stark. 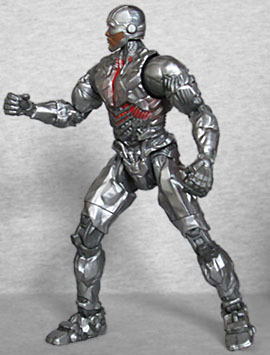 He's still got the "we copied this from Deathlok" shape to his faceplate, but that's not enough. And frankly, the way it's sculpted just makes him look like a lazy cosplayer who made a costume by wrapping tin foil over the clothes he was already wearing. He's angular and lumpy, like PS2-era videogame graphics come to life. You know those "low-res" Virtua Fighter Figmas? At least they're meant to look old and crappy; this is just bad work. We don't blame Mattel for that, we blame whoever's designing the DC Extended Universe costumes. Allegedly the final render of the suit in the film (it's all being done via mo-cap, of course) will feature hollow spaces through the body to better sell the idea that this is a framework, not a shell, but no such thing is present here. The proportions are a mess, too. Maybe it's just because we've been reviewing so many bobble-headed Marvel Legends lately, but Vic's tiny little noggin does nothing to diffuse the impression of a man wearing a bulky suit of armor around himself. Each of his shoulder balls is larger than his head, for pete's sake! The figure stands slightly under 6½" tall, so it's not really that the body is oversized, just the the head is undersized. The articulation is predictably bad. 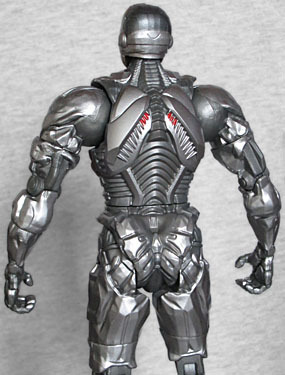 Cyborg has a balljointed head, swivel/hinge shoulders, swivel biceps that are jjust cut straight though the upper arm, hinged elbows, swivel forearms, a swivel waist, H-hips, swivel thighs, hinged knees, and hinged ankles. A fancy robotic design, and that's all they could do with the joints? 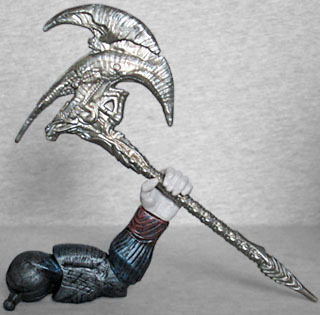 They couldn't integrate them with the sculpt better, or come up with some new fun ones? 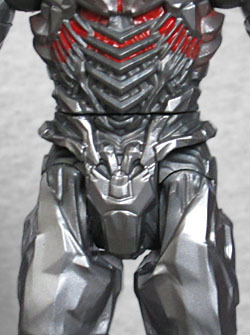 The wrists have round elements on them that are just screaming to be a hinge joint, but there's nothing. Cyborg has one accessory, his sonic cannon. Well, it's a sonic cannon in the comics and the cartoons, it might be a milkshake maker in the movie for all we know. It's the same silver as the rest of his body, and the lighting in the barrel is light blue, contrasting with the solid red in his chest. The right arm pulls off at the joint, allowing you to plug this piece on. But because Mattel is Mattel and the DECU is the DCEU, the stump of the gun is larger around than the stump of the arm, making this guy who already looked like he was a human in a suit of armor now look like a human in a suit of armor with his human hand inside a prop glove. Tremendous accomplishment, team! The villain of Justice League is Steppenwolf, because WB figured as long as they were transparently attempting to mimic Marvel's success, they might as well copy the "keep the major cosmic villain in the background for as long as possible" thing, too. Just because the New 52 Justice League formed because of Darkseid, it doesn't mean the movie one has to, right? No, yeah, let's bring in Steppenwolf, people know/care about him, sure! 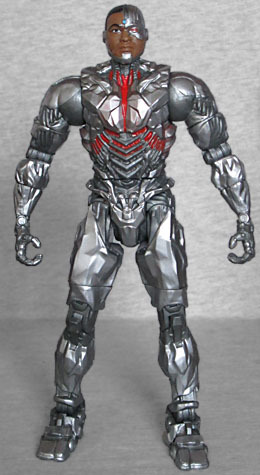 Anyway, he's the BAF for this series, and Cyborg comes with the axe and left arm. The movieverse Justice League has six members, rather than seven (because DC may be desperate for an Avengers, but they're not "let's acknowledge Green Lantern" desperate), and Mattel's BAF series tend to have six figures. Handy! Two of the figures are new characters, two are new costumes, and two are new likenesses. But all six of them remain, regardless, a typical Mattel effort.